Blog from Cairns, Queensland | Kat's Worldly Travels! Hey all... I have managed to find my way along the East coast as far as Cairns... yey, I managed to get myself here after JC flew out from Brisbane. Noosa was fantastic and even got a surf in which was great, weather not that great (again) but didn't stop a very wet walk through their national park. I spent three long long days on Fraser island and didn't have a great time simply due to terrential rain throughout the trip... we felt like we were on a Brat Camp Survival challenge but had a great group so the evening parties were fun...just very wet getting into sleeping bags at night. I managed to not eat, sleep or shower for a whole 3 days!!! Whitsundays was a completely different matter though and had an amazing time diving and snorkelling and watching beautiful sunsets on the water. our cabins were brilliant as well and I slept really well. There was 25 of us in total and everyone was really cool. 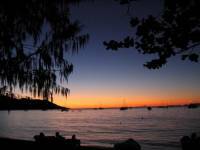 Then I spent two nights on Magnetic Island which was beautiful every beach was stunning and luckily no rain but really really hot and sunny. I even managed two bush walks without seeing any nasties in the undergrowth. Had a great morning holding koala's, lizards, snakes and Cockatoos in a sanctuary on the island which was really good fun. I have been travelling up the east coast with two Irish sisters - Sarah and Charlene who I met on Fraser Island so that has been great fun as their really cool girlies. We are all up in Cairns now and spending our last night together before we go our seperate ways. I'm off on a 3 day trek through Cape Tribulation then onto Alice Springs for a 5 day 4WD safari which should be awesome. Meeting some great people and managing not to get lost...well... not that much anyway!! !